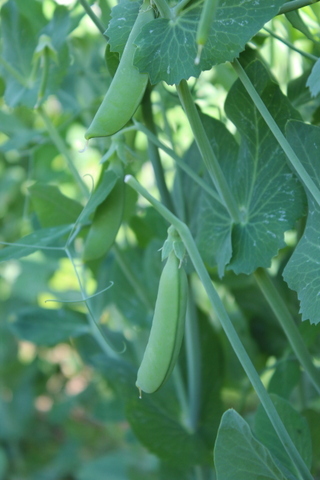 We’re deep into gardening season, and early summer brings some of my favorite crops. 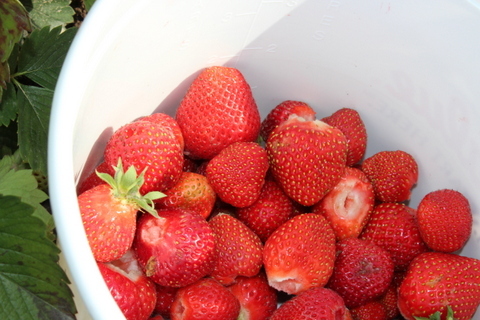 A few weeks ago, we went strawberry picking, which we can’t seem to resist even though we now have our own prolific bed. 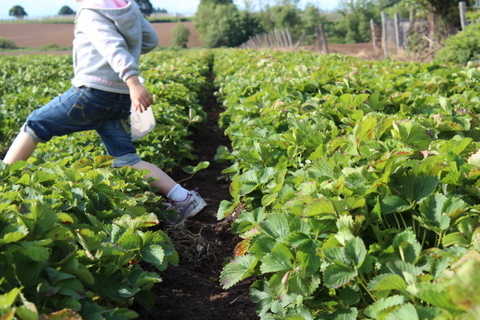 Some good friends own a strawberry u-pick field, and it just doesn’t seem like summer has started until we spend a few hours bending and squatting, filling our buckets and trying to resist eating handfuls of berries which are so sweet and juicy, I don’t care they’re speckled with dirt. I eat them anyway, right there, unwashed. Hot from the sun and bursting with flavor. These ones are our own little gems. Not as good as the variety from the u-pick place, but pretty darn tasty. I made a big batch of strawberry freezer jam, and now have been hoarding away bags from my own garden into the freezer. Some we’ll make into another batch of jam later on in the summer; some will get tossed into smoothies or perhaps a baked strawberry pie or crumble. We’ll deal with that once we’re done with the raspberries, which are practically breaking the vines they’re so thick this year. 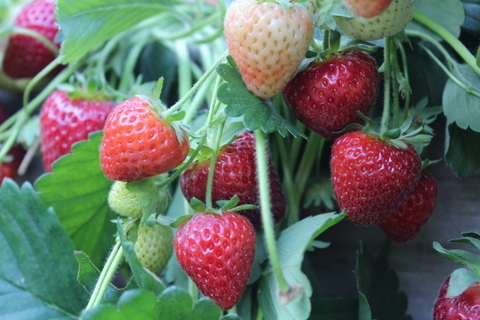 Every day we spend a good 30 to 45 minutes picking, and those berries are accumulating in the freezer, too. We’ve also been piling them with plain yogurt and a jot of honey for an after-dinner treat. Yum. Of course, the peas are thick as well. Have you ever had fresh peas? I hope so. They are so fabulously different from the frozen ones. Like a different food entirely. Their shells are crisp and sweet, and the peas are fruit-like in their sugary flavor. I can’t seem to ever get enough to do anything significant with them cooking wise. They all get eaten by the handful straight off the vine. This year, my four-year-old has her own patch of peas. (“Patch’? I’m not sure what you call it. I guess it would be a row, but it’s only about 3 or 4 feet long, so that seems misleading.) My intention was to give her something to be responsible for–you know, take care of the weeding, and watering and enjoy harvesting them. She has done that a little (and her lack of attention is probably directly correlated to my lack of attention to weeding this month), but mostly she has just become very protective of the peas and doesn’t want anyone to pick them, even though she doesn’t seem to remember to pick them herself until she sees someone else trying to pilfer some. So I’m not sure how effective my plan was. It appears I just gave her something else that has now become difficult to share. In any case, at this time of year, I love to make my kids smoothies in the mornings. This little recipe actually doesn’t use any local fruits or berries, so I feel like all the talk of northwest berries above was misleading. Nevertheless, it’s super yummy and very filling. I love it. 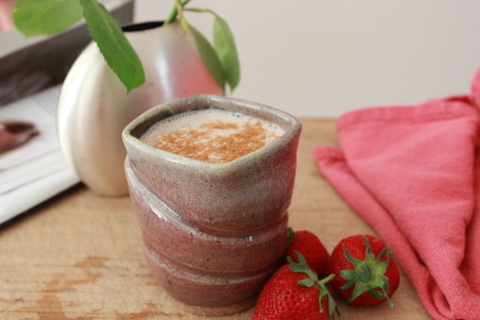 It’s creamy and slightly sweet and substantial enough to get you through a brisk morning, unlike most smoothies which I feel like are more of an accompaniment to something more filling. I’d like to play around with the spices here and definitely recommend you do the same. I love cardamom, so next time I’ll add a dash of that. Cloves would also be nice, of course. I think I’d also like to try Chinese five spice, but don’t have any on hand at the moment. See the headnotes on ideas for which type of milk to use. Special Diets & Allergies: Soy, dairy and nut free, depending on the type of milk you use. Vegan, vegetarian, gluten free if you use GF oats. 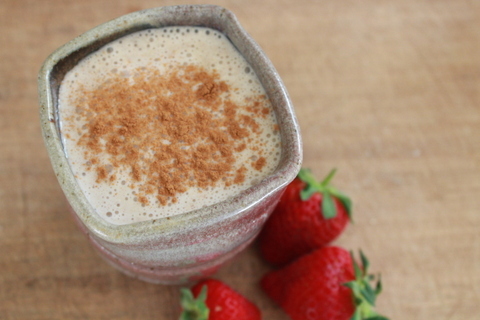 This deliciously creamy, slightly spicy morning drink is sweet and filling. It combines complex carbohydrates with protein from the milk to give you a balanced meal and a great morning start. Throw all the ingredients (except the banana) in the blender or food processor before you jump in the shower to let them soak. The banana and dates already pack a lot of sweetness, so an unsweetened, non-dairy milk is the best option here if you’re looking for a healthy breakfast. To dress it up a bit, though, use vanilla or even chocolate soy or almond milk. I would leave out the dates or cut the amount in half if you do that, and perhaps omit the nutmeg and cinnamon for a chocolate version. 1 medium banana, sliced and frozen ahead of time. Place all of the ingredient except the banana in a blender or food processor. Let soak for 15 to 30 minutes. Add the banana and blend until smooth. 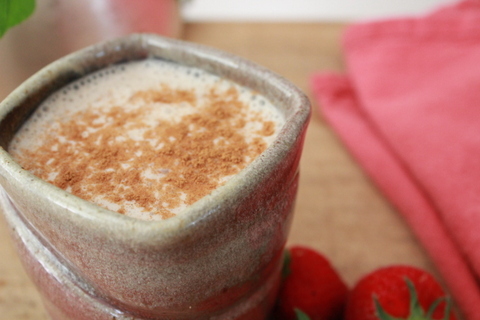 Pour into a glass, and sprinkle the top with cinnamon. Serve immediately. I love your photos, Rosalie! Thank you for the reminder to get strawberries while I can. Some years I feel like I blink and miss them. We have been enjoying our fresh raspberries. We have a bumper crop already. Happy Summer! I am so jealous of your garden. I am sure you can relate somewhat to gardening in the desert southwest. My favorite fruits are raspberries and peaches, and neither grow well here. (Neither do strawberries, and they’re so good fresh!) So enjoy those raspberries for me! That smoothie looks good! This looks delicious. I’m going to try it soon (hopefully). Also, I really like that mug, actually, all of your dishware.